Home » Is Tesla’s Trouble a Preview of the Market’s Next Major Turn? Tesla is a real Wall Street darling. Investors have been piling into the stock for months, driving it higher and higher. Meanwhile, the company’s earnings continue to disappoint, and it’s rapidly burning through cash. But recent news shows the party might soon come to an end, and it could be a preview of what’s up next for the rest of the market. Price-to-earnings ratio (P/E), Relative Strength Index (RSI), and market capitalization to GDP are three of the most common metrics used to determine whether stocks are overvalued or undervalued. Without getting too technical, we’ll simply say that these metrics, when considered together, give us a general idea of the market’s value. For the most part, they rarely agree 100% with one another. They might point in similar directions, but each one takes a different approach to measuring value. Therefore, it’s understandable that they’d give us different results. So when these three metrics do come together to say the same thing, you should probably take notice. That’s what is happening right now. Let’s look at the (P/E) of the S&P 500. It’s now sitting at a 13-year high. Put simply, that means the price of the S&P hasn’t been this far removed from the actual earnings of its underlying companies since 2004. Essentially, traders are buying on sentiment instead of fundamentals. They believe the market can go higher, so they keep buying. There’s no concern about how much stocks are legitimately worth. Step over to the S&P’s RSI and it gives a similar impression. The easiest way to grasp RSI is to think of it as a way to measure not just value, but momentum. How quickly did a stock’s price move over a given time frame, and by how much? RSI answers that question. According to RSI analysis, the S&P 500 is absolutely overbought. It entered overbought territory around the 10th of February, and the signal exists on both the daily scale, the weekly scale, and the monthly scale. Currently (as of 3:15pm on Monday), on the value on the daily scale was above 80 and heading higher. Finally, market capitalization to GDP tells us stocks are overvalued once again – both when looking at the S&P 500 and the more comprehensive Wilshire 5000. With all this discussion of the market being so overvalued, you’re probably wondering what the consequences will look like. After all, it feels like there’s no ceiling to this rally. Who says stocks can’t go on like this forever, overvalued or not? Well, reality says so! And what’s happening to Tesla right now is a perfect example. Despite an aggressive accumulation of debt, ongoing losses, and multiple new public share offerings to raise capital, Tesla has been climbing steadily since December of last year, along with the broader market. Why have investors been ignoring these big red flags? Probably for the same reasons they’ve ignored warnings signs elsewhere in the market: group think, hype, and flawed psychology. But reality is finally catching up. 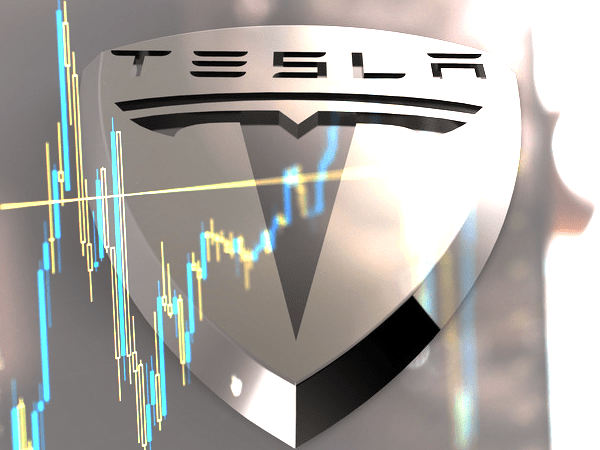 After reporting yet another major loss, Tesla shares dropped 25% this week, and Goldman Sachs downgraded the company from Neutral to Sell, which is only adding fuel to the fire. Suddenly, investors are starting to realize the rally has no substance, and no underlying value in the stock itself. The scary part is that this scenario could just as easily play out again on a much larger scale. Tesla isn’t unique. In fact, it could be viewed as an accurate proxy for the rest of the market, which is equally overvalued and ripe for a correction. But when the correction happens, the consequences will be far more severe. So if all stocks and traditional equities are on the precipice of a correction from all this overvaluation, what should people do to guard their savings? Obviously, only investment vehicles valued with a firm grounding in reality will do. Unfortunately, that rules out maybe 90% of your choices. What you’re left with are real assets like land and precious metals. But there’s a distinct characteristic that sets gold apart from other real assets like real estate. The real estate market can always fluctuate, even fall into lengthy slumps like it did after 2008. Gold can fluctuate too, but it has a built-in safety net that real estate never will. Like anything else, gold prices rely on supply and demand. But see, the average cost to mine one ounce of gold is $1206. This provides a solid “floor” for gold prices. If prices dip below that, miners stop mining, which reduces supply and drives prices back up. And that’s just one of the many reasons why gold is one of the only proven, time-tested ways to preserve wealth. If you’re ready to escape the upside down fantasy world of the stock market – and all the dangerous risks it carries – don’t wait any longer to start seeking security in gold.